If you think the perfect proposal picture is simply made up of a loved-up couple beaming with excitement, I’m here to tell you you’re sorely mistaken. In fact, the perfect proposal picture is made up of a loved-up couple, and a photobombing hippo. Learning this information might leave many people wondering where on earth they can find a hippo to pose with on their special day, but thankfully Nick Kelble and Hayley Roll have already found the perfect animal for the job. Fiona the hippo is a very loveable creature, who is certainly no stranger to the spotlight. After popping out into the world six weeks ahead of schedule, staff at Cincinnati Zoo shared updates about the youngster’s progress, allowing the world to watch her take her first steps, be baffled by bubbles and take her first swim outside. Fiona was even honoured by a brewery who created a beer inspired by the animal. I’m not sure exactly what it tastes like, but it has an adorable picture of the happy-looking hippo on the front, so I’m sold. 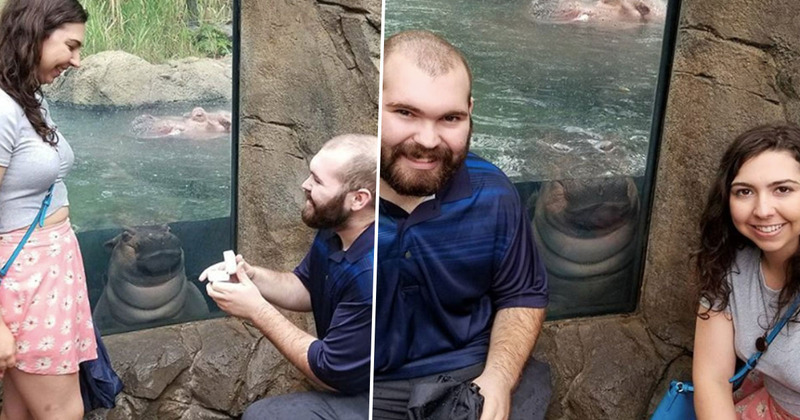 Given her internet fame, visitors at Cincinnati Zoo are often keen to catch sight of Fiona swimming about her habitat, which is exactly what Nick and Hayley were doing when Nick suddenly got down on one knee. Nick and I were waiting in line to get our photo taken with Fiona and I gave my cell phone to someone to take the photo and when I turned back around, Nick was on one knee proposing. But Nick wasn’t the only sight to behold, as Fiona made sure she didn’t miss out and popped up at the window, perfectly photobombing the shot. The hippo looked perfectly content at having the opportunity to join in with the couple’s photoshoot and hung out at the window while the emotional moment played out before her. So there you have it – the perfect engagement photo. It will be a tough one to beat!